80th birthday wishes: Your eighty year old grandpa, grandma, mom or dad may not be on Facebook but that doesn’t mean you don’t wish them. 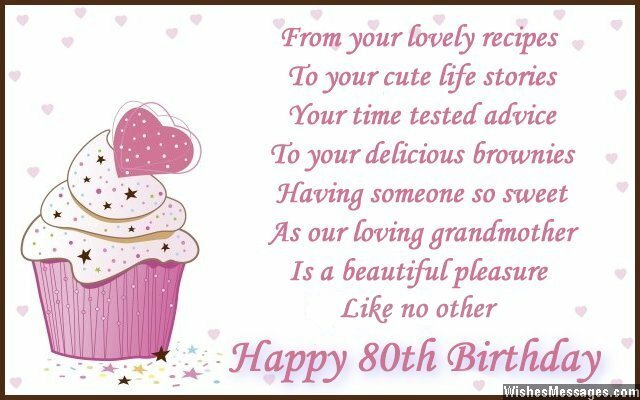 Take ideas from this post to write sweet messages on a special 80th birthday greeting card. Raise a toast to their beautiful life journey by getting family, grandchildren and friends together in a warm little gathering. Think of funny quotes and cute things you can say in a short speech while the octogenarian slices through the cake with wobbly hands. Make sure that turning eighty turns out to be one of the happiest milestone birthdays of their lives. 1) Let’s make it this grand milestone a grand celebration of a grand life of a grand person like you. Happy 80th birthday granddad. 2) You have gone from being an energetic quinquagenarian to a lively sexagenarian to a tough septuagenarian to an awesome octogenarian. Happy 80th birthday. 3) The boxed gift that we give you on your birthday will have a price. But the gift of wisdom which you give us on a daily basis is truly priceless. Happy 80th birthday grandpa. 4) From your lovely recipes to your cute life stories, your time tested advice to your delicious brownies – having a someone so sweet as our loving grandmother, is a beautiful pleasure of life like no other. Happy 80th birthday. 5) You are still feisty and bubbly. Don’t stop being lively, just because you are turning eighty. Happy 80th birthday. 6) You are a living inspiration, walking-talking treasure of experiences and a live example of perseverance. You are an awesome eighty year old. Happy birthday. 7) The secret to living a happy life at eighty is to forget that your bones are turning weaker and remember that your grandkids’ love for you is getting stronger. Happy birthday grandpa. 8) There are very few things in life on which you can’t put a price tag – one of which is a lifetime full of happy memories and beautiful moments, just like yours. Happy 80th birthday to our grandpa. 9) People look up to celebrities and famous people for inspiration. All I need to do is look up to an inspirational 80 year old like you. Happy birthday. 10) The wrinkles on your face speak of all the dreams you turned into reality and your frail smile speaks of the beautiful journey you have taken to reach your destiny. Happy 80th birthday. 11) Turning eighty is a funny feeling. It is a beginning for sure, but a beginning of the sunset years of your life. It is a moment to celebrate, but also a moment to look back at the eight long decades of beautiful memories that you have stacked up in your heart. Happy 80th birthday. 12) Everyone can turn eighty but very few people can turn eighty with grace and a legacy like yours. Happy 80th birthday to our loving grandma. 13) I don’t need books and teachers to tell me how to live my life when I grow up as long as I have a wise grandma to give me the best life lessons that anyone could ever get. Happy 80th birthday granny. 14) The ingredients in your life’s delicious recipe are the people you love, memories you cherish and the dreams you have seen for your children. Hope it has all be worthwhile. Happy 80th birthday. 15) Even though I am 50 years old myself, I want you to know that I will always be daddy’s little girl. Happy 80th birthday dad. 16) You may not be able to win a marathon at this age, but you have already won the marathon of life. Happy eightieth birthday. 17) You have always been forgetful, lethargic and fragile all your life. So turning 80 won’t feel like something new. Happy birthday. 18) You may be old, but for an eighty year old you are pretty bold. You may have aged, but you are not the one to be caged. As you turn eighty today, keep living life just like you have in your own free way. Happy 80th birthday. 19) It doesn’t matter if your age shows on your face or your body as long as it doesn’t show in your spirit. Happy 80th birthday. 20) My teacher asked me what I wanted to be when I grow up. I told her that I don’t care as long as I become as wise and as fun as my grandpa. Happy 80th birthday gramps. 21) Eighty in your life stands for Energetic Inexhaustible Grounded Humble Terrific Youthful. Happy birthday. 22) It is amazing to see that the backbone of the family is a man who is beginning to have a fragile backbone soon. Happy 80th birthday granddad. 23) Turning eighty doesn’t mean that you will be excused for forgetting to reply to my birthday message. Happy 80th birthday. 24) If you were to get a price tag, you would be very expensive because you are nothing less than an antique. Happy 80th birthday old man. 25) Your wisdom is the reason that everyone in the family knows the value of life. Happy 80th birthday to our wise grandma. 26) Our granddad’s birthday is going to be a big celebration because his lifelong hard work is the only reason why all the celebrations in our lives have been possible. Happy 80th birthday. 27) I will congratulate you for turning eighty years old if you can raise your glass and keep it steady while we have a toast. Happy 80th. 28) Just like a book becomes dearer when its pages begin to turn yellow, you have become the most precious person in my life. Happy 80th birthday granddad. 29) Now that you really look old and fragile, I don’t have any choice but to listen to your boring advice. Happy eightieth birthday grandma. 30) Give me the diet plan that you have been following all these years. Even I want to be as healthy and hearty as you when I am eighty. Happy birthday. 31) Don’t worry if you can’t find the energy to blow the candles on your cake. That is how it is supposed to be at eighty so that your grandchildren can do it for you. Happy birthday. 32) You have the wisdom and experience of five eighty year olds put together. Happy 80th birthday to my grandpa who is wiser than an owl. 33) All your life you have showered your love on your children and your grandchildren. Now it is your time to enjoy the affection that your grandkids give you by the tons. Happy 80th birthday. 34) Life has come a full circle around and now you can officially start behaving like a child again. Happy 80th birthday granddad. 35) My grandpa is the strongest, coolest and the most fun eighty year old in the world. Happy birthday.